Edgar Allan Poe's "Murders in the Rue Morgue" launched the detective story in 1841. The genre began as a highbrow form of entertainment, a puzzle to be solved by a rational sifting of clues. In Britain, the stories became decidedly upper crust: the crime often committed in a world of manor homes and formal gardens, the blood on the Persian carpet usually blue. But from the beginning, American writers worked important changes on Poe's basic formula, especially in use of language and locale. As early as 1917, Susan Glaspell evinced a poignant understanding of motive in a murder in an isolated farmhouse. And with World War I, the Roaring '20s, the rise of organized crime and corrupt police with Prohibition, and the Great Depression, American detective fiction branched out in all directions, led by writers such as Dashiell Hammett and Raymond Chandler, who brought crime out of the drawing room and into the "mean streets" where it actually occurred. 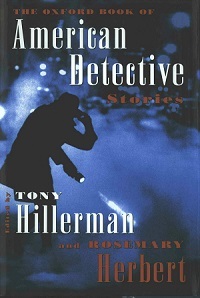 In The Oxford Book of American Detective Stories, Tony Hillerman and Rosemary Herbert bring together thirty-three tales that illuminate both the evolution of crime fiction in the United States and America's unique contribution to this highly popular genre. Tracing its progress from elegant "locked room" mysteries, to the hard-boiled realism of the '30s and '40s, to the great range of styles seen today, this superb collection includes the finest crime writers, including Erle Stanley Gardner, Raymond Chandler, Ross Macdonald, Rex Stout, Ellery Queen, Ed McBain, Sue Grafton, and Hillerman himself. There are also many delightful surprises: Bret Harte, for instance, offers a Sherlockian pastiche with a hero named Hemlock Jones, and William Faulkner blends local color, authentic dialogue, and dark, twisted pride in "An Error in Chemistry." We meet a wide range of sleuths, from armchair detective Nero Wolfe, to Richard Sale's journalist Daffy Dill, to Robert Leslie Bellem's wise-cracking Hollywood detective Dan Turner, to Linda Barnes's six-foot tall, red-haired, taxi-driving female P.I., Carlotta Carlyle. And we sample a wide variety of styles, from tales with a strongly regional flavor, to hard-edged pulp fiction, to stories with a feminist perspective. Perhaps most important, the book offers a brilliant summation of America's signal contribution to crime fiction, highlighting the myriad ways in which we have reshaped this genre. The editors show how Raymond Chandler used crime, not as a puzzle to be solved, but as a spotlight with which he could illuminate the human condition; how Ed McBain, in "A Small Homicide," reveals a keen knowledge of police work as well as of the human sorrow which so often motivates crime; and how Ross Macdonald's Lew Archer solved crime not through blood stains and footprints, but through psychological insight into the damaged lives of the victim's family. And throughout, the editors provide highly knowledgeable introductions to each piece, written from the perspective of fellow writers and reflecting a life-long interest--not to say love--of this quintessentially American genre.